As oil continued to pour into the Gulf of Mexico on a recent Saturday, Jennifer Wilkerson spent three hours on the phone talking about life after petroleum. For Mrs. Wilkerson, 33, a moderate Democrat from Oakton, Va., who designs computer interfaces, the spill reinforced what she had been obsessing over for more than a year — that oil use was outstripping the world’s supply. She worried about what would come after: maybe food shortages, a collapse of the economy, a breakdown of civil order. Her call was part of a telephone course about how to live through it all. In bleak times, there is a boom in doom. 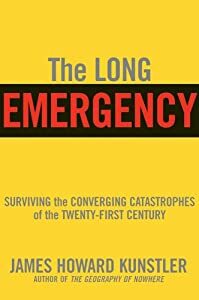 Americans have long been fascinated by disaster scenarios, from the population explosion to the cold war to global warming. These days the doomers, as Mrs. Wilkerson jokingly calls herself and likeminded others, have a new focus: peak oil. They argue that oil supplies peaked as early as 2008 and will decline rapidly, taking the economy with them. Located somewhere between the environmental movement and the bunkered survivalists, the peak oil crowd is small but growing, reaching from health food stores to Congress, where a Democrat and a Republican formed a Congressional Peak Oil Caucus. And they have been resourceful, sharing the concerns of other “collapsitarians,” including global debt and climate change — both caused by overuse of diminishing oil supplies, they maintain. Many people dispute the peak oil hypothesis, including Daniel Yergin, the Pulitzer Prize-winning author of “The Prize: The Epic Quest for Oil, Money and Power” and chairman of IHS Cambridge Energy Research Associates, a company that advises governments and industry. Mr. Yergin has argued that new technology continues to bring more oil. Andre Angelantoni is not taking that chance. In his home in San Rafael, Calif., he has stocked food reserves in case an oil squeeze prevents food from reaching market and has converted his investments into gold and silver. The effects of peak oil, including high energy prices, will not be gentle, said Mr. Angelantoni, a Web designer whose company, Post Peak Living, offers the telephone class and a handful of online courses for life after a collapse. Transition US, a British transplant that seeks to help towns brace for life after oil, including a “population die-off” from shortages of oil, food and medicine, now has 68 official chapters around the country, since starting with just two in 2008. Group projects range from community vegetable gardens to creating local currency in case the national one crashes. Bleak books like James Howard Kunstler’s “The Long Emergency: Surviving the End of Oil, Climate Change, and Other Converging Catastrophes of the Twenty-First Century” and Richard Heinberg’s “The Party’s Over: Oil, War and the Fate of Industrial Societies” have sold 100,000 and 50,000 copies, respectively, according to their publishers. In Congress in 2005, Representative Roscoe G. Bartlett, Republican of Maryland, and Senator Tom Udall, a New Mexico Democrat who was a representative at the time, created the Congressional Peak Oil Caucus. Web sites, online videos and numerous social networks connect adherents in ways that would once have been impossible. Like several people in the telephone class, he said his concern with peak oil had strained his relationship with his spouse, creating an “unbridgeable” distance between them. Despite the rapid growth of Transition US, the movement was much easier to sell in England, said Raven Gray, who came to this country to found a branch here. While Americans embrace doomsday scenarios, they are less likely to work together on how to live afterward, she said. For Mrs. Wilkerson, who is now growing vegetables in her kitchen, the course, which cost $175, gave her encouragement to move in that direction. “Whether or not collapse happens, being able to teach other people to grow food so they can weather any adversity is a good investment of my time,” she said.